I think I must have jinxed myself when I posted about my low AHI score the other day. 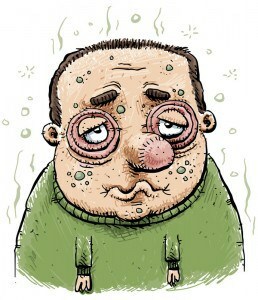 Within 24 hours I was coming down with cold and flu like symptoms – just generally feeling rotten. There was however, a bit of morbid curiosity wondering how my sleep apnea treatment with CPAP would work if I had a cold. Would I be able to sleep with the mask on? Would a runny nose during the night create difficulties with having to remove the mask to wipe or blow my nose? What would the impact on my AHI be? I had a ton of thoughts racing through my head about my sleep would be impacted by the onset of this cold. Did The CPAP Mask Actually Help My Cold Symptoms? First of all, the cold turned out to be fairly minor. It never really turned into anything really severe, a bit of nasal congestion, sore throat and some phlegm in the throat. I actually attribute this faster recovery to my CPAP machine in some respects – I feel that the forced air helped keep my sinuses and nasal passages more clear, but also I just slept better and my body recovered properly. Secondly, related to the first point I suppose, but my nose never really got runny so the whole dirty nose into the full face mask thing I was dreading never really became a problem. For a head cold and sore throat, my nose was surprisingly clear! Finally, I do think my sore throat and the phlegm has been wreaking a bit of havoc on my sleep numbers. I’ll start by saying that my AHI for the last 7 days is 8.9 and it has averaged in excess of 12 for the last four days – last night was 13.4! The 90th percentile pressure was 18! Normally it is 13. Here’s my hypothesis… My breathing is being interrupted and having problems because of the sore and swollen throat. I know I’ve mentioned phlegm a couple times, but it really is just stuck at the back of my throat and even when I’m awake it is causing my breathing to rattle a bit. I think the machine is seeing this as a reduced flow of air, is hiking the pressure to compensate and because of the stuff going on with my throat, the flow isn’t improving. With that happening the pressure is staying really high and that sustained high pressure is causing an increase in leaks. I noticed it last night when I woke up in the middle of the night because of the air leaking into the corner of my eye – the pressure was unlike anything I’d ever noticed before with my Simplus mask. As I adjusted the mask a bit, it started making “fart noise” and squealing sounds. I ended up just tightening the straps really tightly and falling back to sleep. It will be interesting to see if my numbers go back to normal over the next couple days as my condition improves. The upside of the whole thing is, despite the cold, I slept really well and with minimal disruption. I’d really like to read about your experiences with your CPAP Mask and having a cold or flu, so please leave your comments below!